One of the most fascinating episode in the religious history of Southern India is the rise of the Virasaiva movement. These heroic followers of Siva----also called Lingayatas---are characterized by a unique combination of intense devotion and social reformation. The movement arose in the twelfth century under the charismatic leadership of Basava. Men and women from every backgroud, highcaste as well as untouchable, joined the experimental community of the Virasaivas. They has their own sacred literature in the form of short poems in the vernacular language of the region: Kannada. 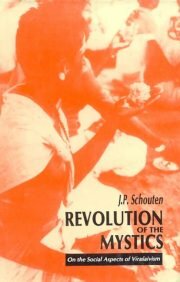 Dr. J.P. Schouten (1949) studied theology and sociology at the Free University in Amsterdam. He specialized in phenomenology of religion with special attention to Indian relgions. He published a number of articles on Hinduism in particular about Hindus in the Netherlands and about Hindu-Christian dialogue. He made several study tours to Southern India in connection with his research on Virasaivism.